52 Cocktails is on holiday! 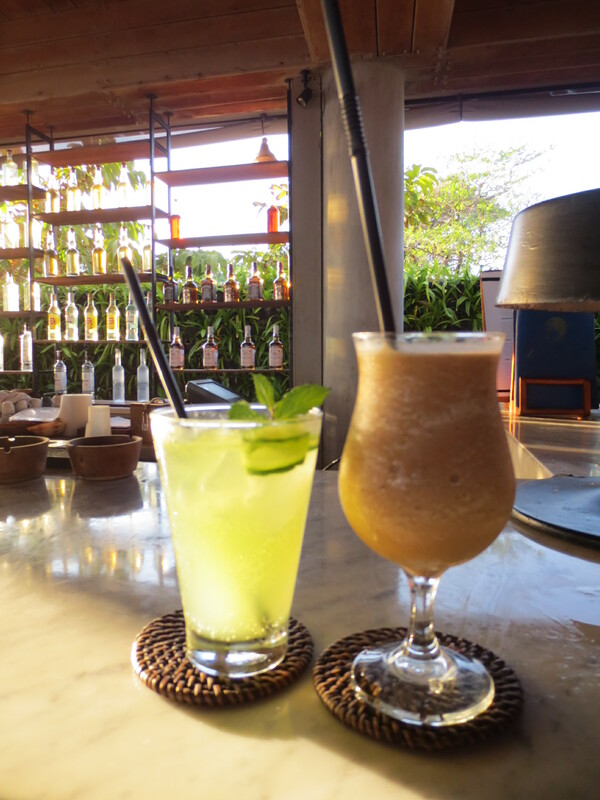 Naturally, it’s a working holiday – we’re flat out sampling cocktails in Bali so you’ll know which ones are the best. Yeah, we’re nice like that. We tried these beautifully presented concoctions at Potato Head, one of the most architecturally stunning bars on the island. Words won’t do it justice, so take a look at the pics on their website (or better still, go visit.) This place pretty much defines cool, with nattily attired staff, well-written menus, funky furniture that’s been carefully chosen to look like it doesn’t quite match, plenty of space to lounge by (or in) the pool and a brilliant view of the sunset over the sea. We’ve visited many times over the years and it’s as popular as ever, though it must be said the drinks are (sadly) not always as good as we remember them. A new menu was presented to us this year and, although it contained some old favourites that we were longing to get stuck into, there was no way we were going to pass up the chance to try something new – namely, the Volkano Agung, described as being ‘served in a bubbling volcano bowl’. Yep, a bubbling volcano bowl. Who could resist!? That’s it on the right (kindly forgive us for not capturing the moment actual bubbles were coming out of the central funnel-y bit into the bowl. You’ll just have to believe us when we say it looked really, really ace). And the taste? It was a strong mix of rum and pineapple, heavy on the rum and not as well-balanced or interesting as previous drinks have been here. But hell, it looked good. 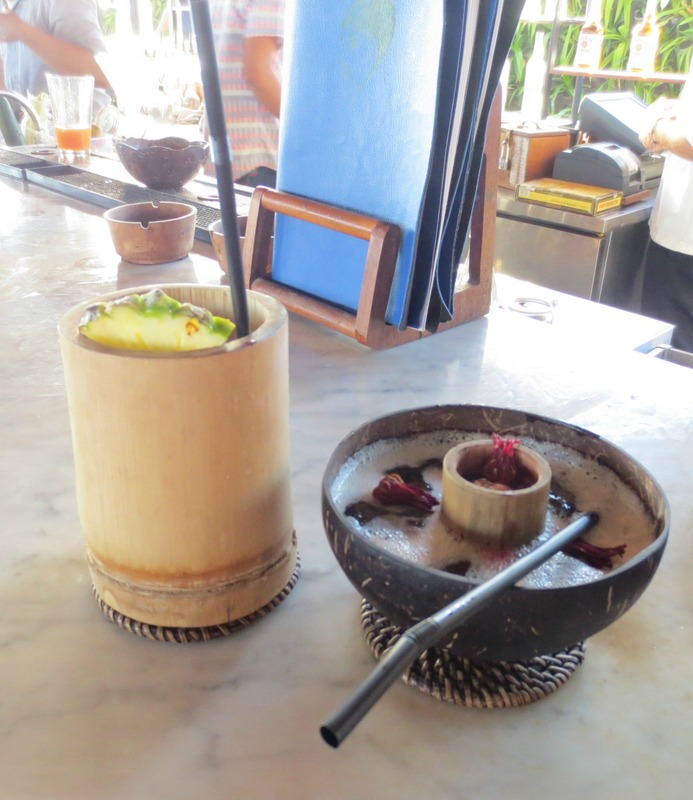 In keeping with the Tiki theme, we also tried the Bobobobo (presented in a bamboo cannister – that’s it on the left), a much more interesting mix of rum, pineapple, peach and honey (among other ingredients, such as arak, the local rice liquor) blended with ice to create a thick, chunky, slushie-style drink. It was refreshing and lively, but also frustrating to drink – turns out sucking up ice through a thin straw actually is hard work. No wonder 7-11 provide larger straws with their Slurpees – one of those suckers would have been perfect. In short, the presentation was excellent, but a lack of attention to detail was the downfall of these drinks. We’d like to say it’s not enough for Potato Head to look cool, and that the drinks need to taste as amazing as the venue looks if they want to keep their customers happy, but judging by the constant stream of bright young things piling in at all hours of the day, perhaps it doesn’t matter. When a place is as buzzing as this one, you’re prepared to forgive their transgressions – which roughly translates to, despite not loving our drinks we decided to order another round. This time we tried two more newbies, the Timun Tonic (left) and the Kopi Colada. The Colada was a blend of coffee bean-infused arak, chocolate spread and peanut milk that tasted rather like a chocolate milkshake. Meh. But the Timun Tonic – wow. This long, refreshing mix of lemongrass-infused gin, cucumber syrup and tonic water (with a dash of absinthe and celery bitters for good measure) was a fantastic reminder of why we love drinking at Potato Head: the drinks are (usually) innovative and delicious and worth returning for. Which we did, the next day. The place is like a magnet and we were drawn back for another Timun Tonic – because when you’re onto a good thing, stick to it, right?